Every quilt has a story. Well, at least mine all do. 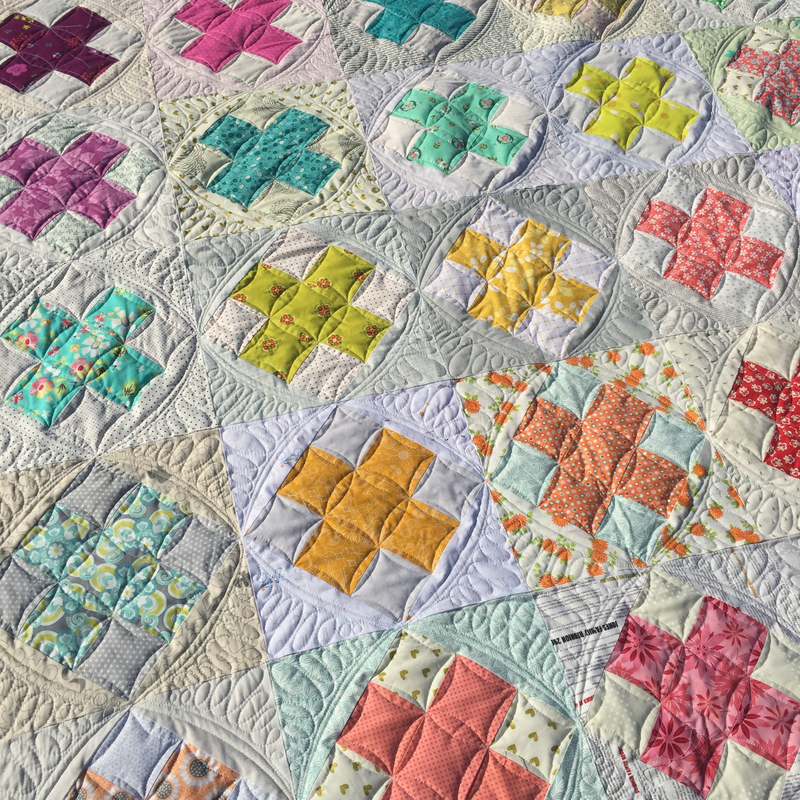 For me and my quilts, a lot of the story takes place before the quilt is even begun. This is because my favorite parts of quilting are dreaming, planning, and scheming. My ghost quilt started in an unusual way. It started with a bundle of fabric that I won on Instagram. I don’t enter every giveaway that comes along, and I barely remember entering the giveaway for this bundle of V and Co Ombre Confetti from Cottoneer. But I won! And boy was I excited to receive the beautiful bundle in the mail. It was packaged so pretty and I enjoyed all of the printed materials that came along with it! I sat the bundle in my sewing room. I saw it almost every day, and believe it or not, I was stumped as to what I was going to make with it. My wish list of quilts to make is always long, but this fabric bundle didn’t seem to fit any of those quilts. Until one day it clicked. I was just wrapping up my quilt for the Dash Along, when I saw Then Came June was hosting a sew along for the Ghost Quilt. And there in my sewing room was a stack of disappearing fabrics! The Ghost Party was about to begin! First I was going to have to test out my ombre ghost idea. I hadn’t worked with VandCo’s ombre fabrics before, but of course I had seen them, and drooled over projects made with them. It took some planning, which I love, and even an upside down test block to make it work. I chose five colors from the stack of fabric from Cottoneer. I decided to leave out the beige shades, and I let my daughter use the dark blue for a sewing project in her FACS class at school. Since there are 25 ghosts in the quilt, I could make five ghosts from each of the five remaining colors. I headed to my LQS in hopes to find a solid white or light gray for the background. Their selection of solids is slim, so I couldn’t find what I wanted, but I did find this awesome tiny gray and white polka dot. And for the eyes and mouths I pulled a grey textured print from my stash. I have a confession: I love cutting out quilts. And making pretty stacks of fabric. This quilt took some extra detail in cutting. I had to make my own cutting directions, so that the pieces of the ghost were darker at the top and lighter at the bottom. First I made a test block, which ended up fading from light to dark instead of dark to light. With that lesson learned, I adjusted my cutting layout, and got a correctly fading ombre confetti ghost block. I sewed my ghost blocks together in sets of five, one color at a time. I chain pieced each section to save time. As I began the first set, I started thinking about how I would layout the different colors of ghost. You will notice that the tails on the ghosts alternate directions. I love this about the pattern because it gives the sensation that the ghosts are floating. There was a part of me that wanted to line these ghosts up by color, but I wasn’t sure. So I only made the top half of the ghosts first. After laying out the ghost tops, and asking all of my Instagram friends I decided to go for a random layout. I laid out the tops of the ghost blocks in the order I desired, snapped a photo, stacked the blocks in columns, and pieced my top together. Finishing a top is a great feeling! I drug it around my house and yard taking pictures and fraying the edges. At some point here, I realized I really needed to stay stitch around the edge of my quilt. I love when quilters send me their quilts to be quilted with a stay stitch around the edge. It helps the fabric from fraying as I load it on the machine. It also prevents seams on the edge of the quilt from pulling apart. I drew up several quilting ideas for this quilt. 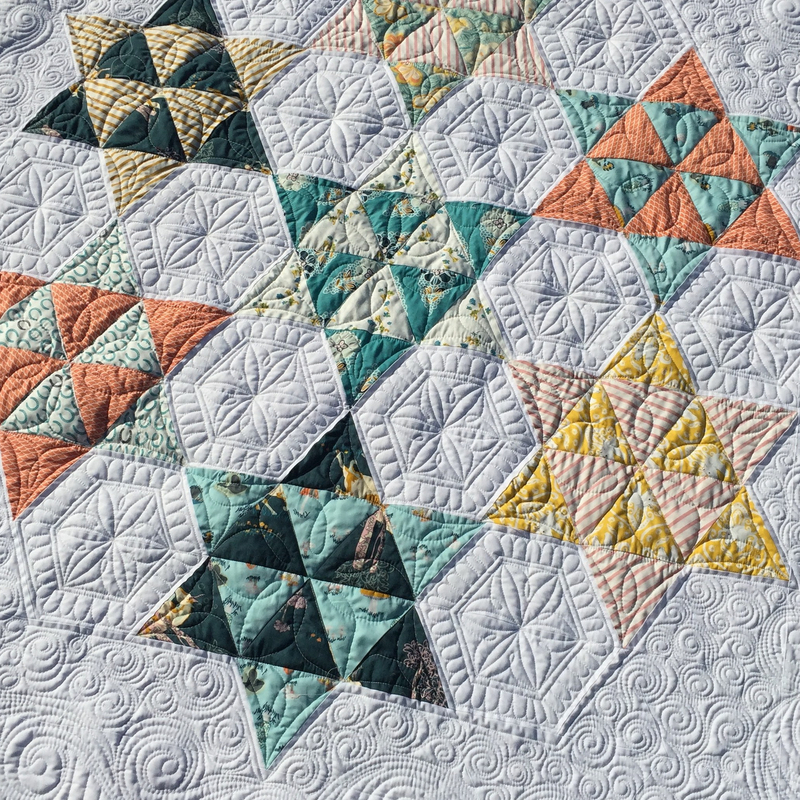 Movement is the one thing that I wanted to portray with the quilting. I wanted these ghosts to appear as if they were floating in the air in a wispy sort of way. Swirls and crosshatching were my final choice and I love how it turned out! If you are interested in my machine quilting services read this post. When it comes to quilt backs I can be a bit of a procrastinator. It was no different with my ghost quilt. However, it worked out one day that I needed to run an errand near Target which is about 30 minutes from my home. I had seen many quilters in Instagram say they had had success with using sheets from Target as quilt backs. I ran in Target to see what they had and to my delight, I found a sheet in the perfect color! The sheet was a huge success. I trimmed on the hemmed edges first, gave it a good pressing, and had no trouble quilting it on my long arm quilting machine. After one washing it is nice and soft and crinkly. Originally I had picked out a black and white print from my stash for the binding. But when the top was finished and quilted, I put the black and white print next to it, and just wasn’t feeling it. Thankfully, there was just enough confetti ombre fabric left to do a scrappy ombre binding which looks fabulous on the edges. Here is a link to my favorite binding tutorial. There you have it, my favorite quilt that I have ever made to date. 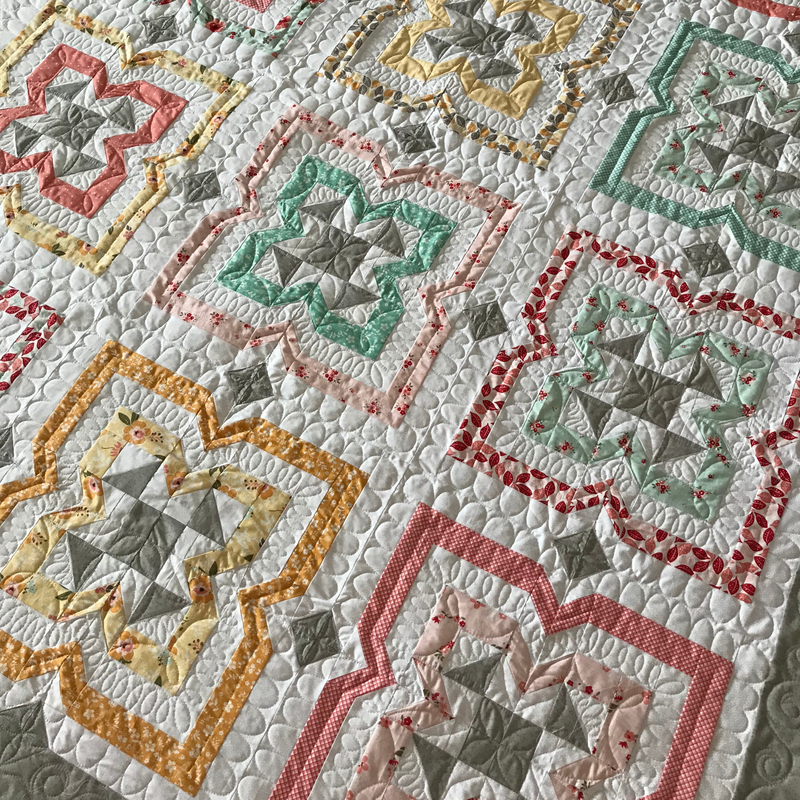 A modern quilt, and a holiday quilt all in one! I used fabric that I won, and tried out a sheet back for the first time! I drug this quilt to the pumpkin patch and on a weekend get away. Now I have many photos and many memories of the time I enjoyed making and sharing this quilt.